Can The Carrera Banshee Mountain Bike Satisfy New Users And Experienced Riders Alike? The Carrera Banshee Full Suspension Mountain Bike is an attractive, tough-looking bike that boasts a lightweight alloy frame, SRAM 24-speed gearing and 4 bar horst linkage suspension as part of its specification. The product was Voted Number 1 “Best Aggressive Full Suspension Bike (Entry Level)” by Bike Radar, so which is it? 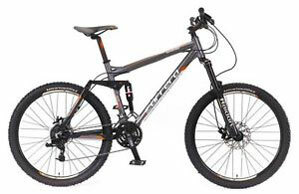 Is this the ideal mountain bike for beginners, a tough model for experienced users to throw around a course or both?